There is a pleasing symmetry about the Royal Academy at the moment, which has nothing to do with its architecture. On one hand ‘Revolution; Russian Art 1917 – 1932‘ on the other ‘America After the Fall, Painting in the 1930s’. We went to the latter last week, having been to the former earlier in the year. 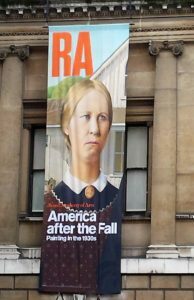 The RA courtyard is decorated with banners from both exhibitions, with the father and the daughter from Grant Wood’s famous and instantly recognisable American Gothic hanging on either side of the entrance portico. The similarities of treatment continue, as both exhibitions include ‘timelines’ in their programme. In ‘After the Fall’ this begins with the election of Herbert Hoover in 1929 swiftly followed by the Wall Street crash and runs through the years of the great Depression to the U.S.’s entry into WWII in 1941. The periods covered by the exhibitions don’t coincide, yet, having seen both shows, some of the artworks could have appeared in either. 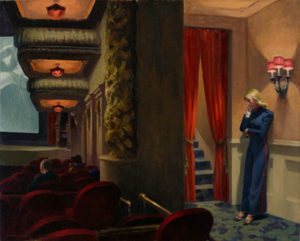 In both countries artists were responding to similar stimuli; to industrialisation – almost photographic realist paintings of massive machinery appear in both exhibitions; to urbanisation – there are paintings of city life in both, but also paintings which embody a nostalgia for a rural way of life which was passing; and a response to changing societies – through portraiture and surrealism. One major difference is that American artists ( and I assume that this is a representative sample ) did not, by and large, move so early to abstraction, that came later in the U.S., unlike the avant-garde in Russia. So most of ‘After the Fall’ could be classed, with a few notable exceptions, as representational art. It does include some famous paintings. I recognised the Hoppers, a Georgia O’Keefe and one or two others, but most of the paintings in the exhibition were new to me, as were most of the artists. Now I want to know more about them, especially Grant Wood, whose rural landscapes I hadn’t seen before and was very impressed by. Some reminded me of Paul Nash works, both the pre-war landscapes and those later in his career. 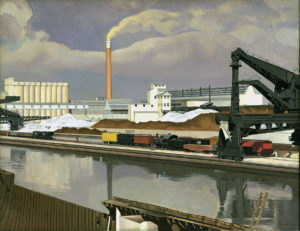 I also admired Charles Sheeler’s industrial landscapes, like the wonderful American Landscape. But there was much else – the city pictures of Stuart Davis ( which could have come from the Russian exhibition ), the sad pictures of the grisly dance marathons, like that featured in the cinema film They Shoot Horses Don’t They or the louche shenanigans of the sailors on shore leave. This isn’t a large exhibition, 45 paintings only, especially when compared with the blockbuster multi-media Russian exhibition next door. This left me wanting more – more art and more information about the artists and their other works, whereas the Russian exhibition had left me sated. The programme notes are also better in my opinion, concentrating on the artists and what inspired them, rather than the contextless commentary in the Russia exhibition which gave, in my opinion, a distorted picture of the Revolution and what happened after it. ‘After the Fall’ is on at the RA until 4th June 2017. It costs £12 per ticket and is very well worth a visit. Details can be found on the web-site of the RA, booking is essential.